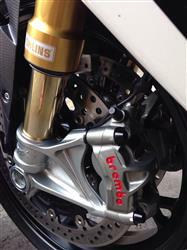 Ducati 1199 / Monster 696 / Hypermotard 821 Titanium Front Caliper Bolt Kit 2PC By CNC Racing. Pessimistic about what could happen to your outdated front caliper bolts? By purchasing the titanium front caliper bolt kit by CNC Racing you will not even think about what the outcomes are. Let the titanium speak for itself with its premium touch and finish allowing corrosion protection. Enhance your bike experience with a touch of fine tuned engineering. The use of titanium grade 5 allows a considerable saving of weight and maximum corrosion protection. These bolts are precisely machined from solid titanium billets structurally reinforcing the bolts. Colour matching is an essential aspect of custom bike building, therefore now we also have the application of Diamond Like Coating (DLC) to produce a deep black bolt kit. Brake calipers are an integral safety aspect of motorcycling, thus upgrading to Titanium bolts will ensure you never have a broken hanging caliper from a low slide. Titanium is known to flex under extreme forces but retain its shape which will translate into hard wearing bolts. Conical shaped deep Allen key heads help with leverage when tightening and also will be more visually eye catching. In addition, due to their tensile strength damaging screw threads or rounding off the head will be a thing of the past. Upgrade the overall spec of your motorcycle with these stylish bolts. Perfect addition for track day bikes or just the casual fair weather rider. These front brake caliper bolts are highly corrosion resistant from the curing process and are incredibly lighter than original OEM steel bolts. The kit consists of 2 titanium bolts that will fit one caliper. Please note that this kit is for just 1 front caliper thus models with double disc brakes would require 2 kits. SUPERIOR DESIGN AND AESTHETICALLY PLEASING FOR YOUR DUCATI SUPERBIKE BY CNC RACING. Now my Brembo M50 looks complete!